In my Mother's Day post I discussed a wittle bit about what I've deemed "Crib Gate 2015." Basically, to bring you up to speed, late last week Patrick figured out he could climb out of his crib. Ruh-ro. We knew for a while he was clearly big enough to get out, he just had never attempted it. Well, not two days after his 2 year check up (and us talking about how big of a boy he is now), he figured it out, and out he climbed. He actually did this about 20 minutes before Mike had to leave for work during nap time and I flipped. I was not ready for this, but more so not ready to deal with his on my own while Mike was on nights. I was not happy. Well, after 3 escapes during nap, he finally fell asleep and I dreaded bedtime that night, knowing he'd probably do the same thing. Yup. I was right: I put him to bed at 8:30pm that night, and spent the next TWO HOURS watching him on the video cam and going into his room every 15 minutes catching him mid-escape and scolding him for climbing out of his crib. I think I even said to him, "I can see everything you do in here!" and I'm pretty sure he laughed at me. Actually, I know he did--every time I went in to put him back in bed he laughed, no matter how stern my voice was. What.the.heck. I couldn't even use my teacher voice to get him to stay in bed! Let's just say I didn't sleep well that night at all. I was so worried he'd wake up in the middle of the night, climb out, stick his finger in an outlet, or get out of his room and wreck havoc on the house while we were sleeping. Ugh. The next morning I got up and Mike dealt with Patrick while I completely babyproofed his room, rearranged the furniture, like putting his changing table in front of the window, blocking off the outlets over there AND the wireless modem and router the genius AT&T installer put in his room cause "there was no where else to install it" (ha, yeah right), installing another webcam in the other corner of his room so we could see both room angles now, and putting a childproof door knob lock thingy on the inside of his room so if he got out he couldn't get out of his room. So, if he did escape at least his room is Patrick-proofed. We then lowered his crib mattress even more, so it was practically on the ground, and we patted ourselves on the back, saying we just outsmarted him and gave ourselves maybe a month before we had to do the toddler bed transition. It's not that I'm anti toddler bed--quite the opposite. 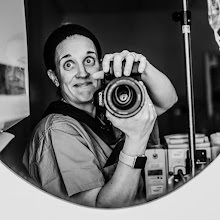 However, I am not ready now to make that transition! I don't think Patrick is ready for that freedom, nor am I ready for him to have it. (Shoot, maybe he is ready and I'm just chicken and not giving him a chance...eh, still not ready for him to have it!) Anyways, I want him to be a little older before we move him because I think it'll go better for him (and us) and he'll be "ready" for it (which my mama-instinct doesn't think he's ready right now). So nap time after we fixed his room and lowered his bed went fine...until bed time. 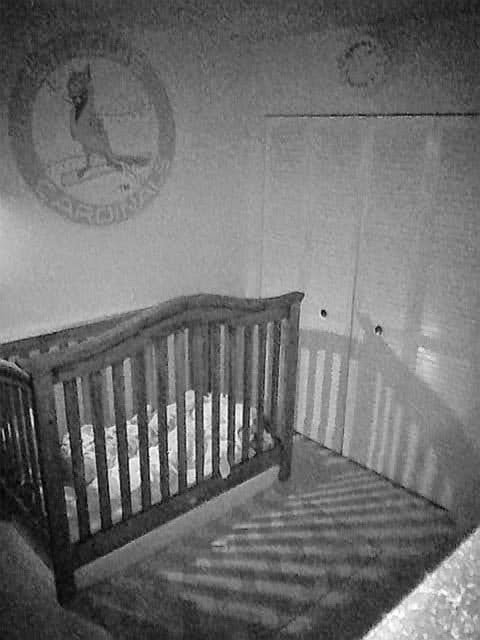 Bed time (again, with Mike working nights and me flying solo) didn't go as well--again, me spending 2+ hours glued to the video monitor making sure he didn't escape. Well, he did. UGHHHH. The bed was a good 8 inches lower and he still managed to escape! NOOOOOOOOOOO!!! I think I called Mike crying that night because I didn't know what to do. I'll blame the hormones on that call. Eventually he fell asleep, but again, I didn't sleep well cause I was too worried he'd get out of his crib. Anyways, my friend Tiff had suggested we flip his crib around, so the high part was facing outward and the lower part was against the wall. 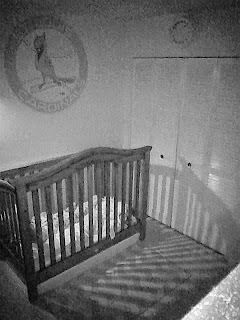 The next morning we flipped his crib around so the tall part was facing outwards and, knock on wood, we're on day 3 of that and it is working. 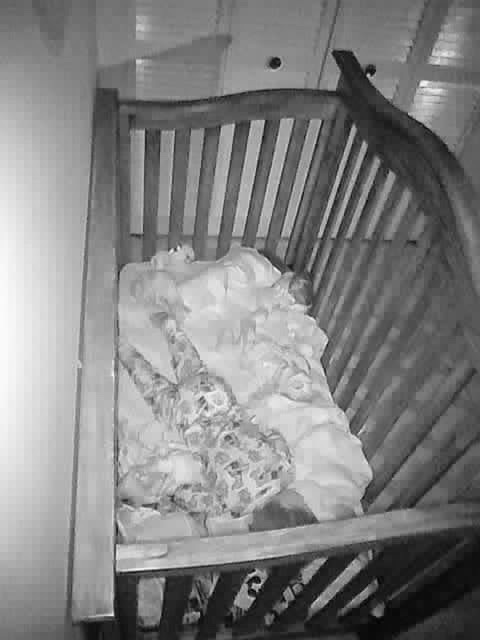 Not one single even attempt to get out of his crib--I think cause it's just way too tall. SUCCESS!!! --for now. Let's not get too excited there Alex. However, my mama worry is still on high-alert and I'm glued to the video monitor during nap and bed times...cause I know we are just prolonging the inevitable of going to a toddler bed. BUT, we're pressing on with this, our last-ditch attempt to keep him caged before we go to the toddler bed. I will add that since all of this started, Patrick falling asleep--both for naps and bedtime--is taking FOREVER. Like 1-3 hours for him to actually FALL ASLEEP...which is crazy (he use to take 10-30 minutes max!). He's definitely going through some sort of transition/growth spurt or something, cause it really is taking him forever to fall asleep. Luckily, when he does fall asleep he thankfully stays asleep for 2-4 hours for nap, and 10-12 hours for bedtime. Thank the good lord above for that. I'm SURE I will keep you updated on this super exciting front in the days (no!! how about months!!) to come...so stay tuned. And any prayers, well wishes, positive thoughts for Patrick STAYING PUT in his crib FOR NOW would be appreciated...cause we're not ready for this move just yet. Thanks friends.